Luckily, there’s a new trend for displaying art that requires a whole lot less planning and results in an effortlessly cool finish. We’re calling it the lazy stack. Not exclusively confined to the walls, this method typically entails a handful of prints displayed in a singular line—much like one would find at a museum—and more often than not, stacked against the wall on a console. While this method requires little explanation or guidance (consider it foolproof), we rounded up a few tips to help you get started nonetheless. Filter the prints in a well-styled bookshelf to insert an element of diversity and interest, providing a dose of relief from the piles of books. Bonus points for using prints of a complementary scheme for a more integrated finish. Set your prints atop a lengthy console or media center, alternating between horizontal and vertical frames to create a diverse assortment. Here is your chance to decorate freely with an eclectic range of pieces that vary in theme, style, and color. Step up your shelfie game. In lieu of hanging shelves higher up on the wall, opt for a lower display for a more dramatic finish. Pair the shelf with oversize prints and filter in smaller decorative objects to break up the continuous flow of art. 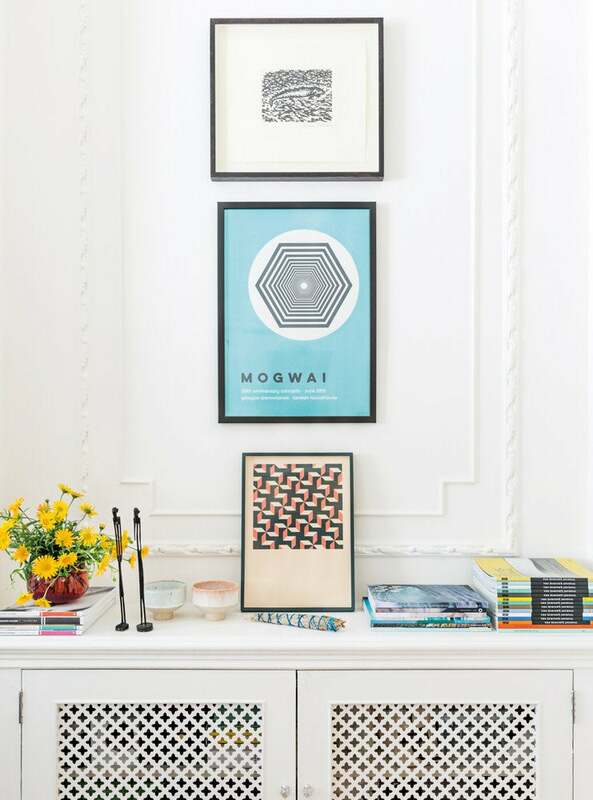 Hang your wall art and prop another print on a low-standing console directly beneath or next to it. Consider this the lazy person’s guide to faking a gallery wall with effortless ease. Pair lengthy shelves with an assortment of prints in lieu of books—bonus points if the shelves are part of a built-in unit like that of this NYC apartment. Aside from the eye-catching detail it adds, this display method makes for the ideal arrangement for showing off your finest prints. Line a stack of prints on a freestanding bookcase to accentuate the visual height of the structure. Take note of this captivating scene spotted in an artful Brooklyn loft, where the prints inspire a layer of visual depth to the room. Curate your prints by color, style, or theme. When arranging the prints in line on the walls, opt for either two or three prints to avoid an overly busy feel. In this curated nook, a pair of wanderlust-driven pieces plays to the tonal scheme of the room, as well as the bar tray set on the mid-century credenza. For the home office in need of a boost, consider pairing a wall-facing desk with a couple of statement-worthy prints for a daring effect. This Brooklyn Heights study takes high-contrast living to a whole new level. Working from home never looked this good.